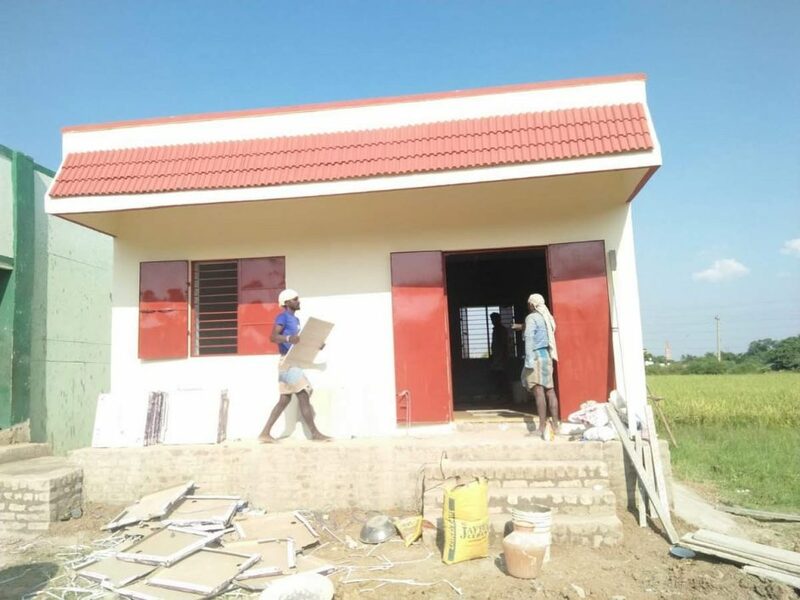 In September 2018 : Hyundai Glovis sponsored library construction at Annanagar continues in September of 2018. All the construction work completed in early October. The construction activities at the building speeded up and all the work got completed by the middle of September. Tiles have been laid inside and outside. Tiles have been stuck to the roof. The building is fully painted inside and outside. Electrical fittings have been done. Tables, chairs, bureaus etc. have also been purchased and delivered to the building. However because of rains the work outside the building in raising the ground level could not be taken up. Because of this setting up the play area and planting of trees could also not be taken up. On September 29th we had planned to have the inauguration of the library. Becuase of rains the outside work got delayed and we postponed the function to October 13th. We instead had our monthly teachers’ meeting in that building. This was also a trial run for the building to ensure that everything worked properly. The rains continued in October as well and we just managed to get all the work done in time for the inauguration after some days of working day and night. All of these works got completed in October. Leveling the ground with 10 tractor loads of mud. Completing the setting up of the furniture inside. Setting up of the play area outside on the leveled ground. Spreading 5 loads of sand in the play area and in front of the building. Planting 10 tree saplings in the school compound. Putting a banister on the corridor / steps to prevent children from falling down. Setting up lights in the corridor and outside. Reinforcing the doors and windows. Putting up a name board for the library. Mounting the projector in the ceiling of the library. Decorating the library with stickers. Click here to see the photos from the work in September and here to see the photos from the work in October. Asha for Education in the US is a registered 501(c)(3) non-profit charitable organization. Asha India is a registered trust in India with 80-G and FCRA clearances. Your donations to Asha Chennai will be tax exempt both in India and in the US.